Does Gold Belong in Every Portfolio? In times of crises, many turn to gold, seeking its safe-haven attributes. However, with a 28% price drop in 2013, followed by a 12% gain in the first ten weeks of 2014, can we really continue to label gold a safe haven? No investment is “safe.” Gold is no exception, of course, given that our daily expenses are generally not priced in gold, but in a currency that fluctuates relative to the price of gold. However, we believe gold continues to play an important role as part of a diversified portfolio. We would go so far as to say that gold belongs in every portfolio. In the following analysis, we take a look at the impact of gold on a portfolio under various scenarios. The results may surprise you. Unlike equities, bonds, and currencies, gold is not a liability of any government or corporation. Governments and institutional buyers invest in gold directly, and they’ve been doing so for decades. For centuries, people have turned to gold during times of economic uncertainty. To put the above chart into context, in 1934, during the Great Depression, the price of gold was $35 an ounce. 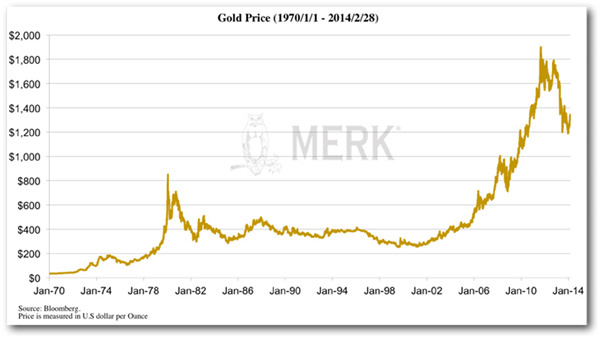 On February 28, 2014, gold was priced at $1,326. That’s an average annual return of approximately 5%. With the benefit of hindsight, let’s look at what would have been the optimal portfolio allocation to gold over different time periods. Over the past ten years, gold has been one of the top-performing asset classes. Even with the decline in 2013, investors with gold in their portfolios still managed to achieve high returns. Using the models of modern portfolio theory, we determined that the optimal portfolio allocation between gold and the S&P 500 over the prior ten years (see table below) consisted of 68% gold and 32% S&P 500. This takes into account the level of risk in each asset class and the correlation between the two. Investing solely in the S&P comes with greater risk. The table below supports the claim that gold mitigates risk and acts to improve the risk-return profile of a traditional equity portfolio. We’re not saying, by any means, that all investors should allocate more than half of their portfolios to precious metals. There are plenty of reasons to be critical of modern portfolio theory, not the least of which is that hindsight is usually a key element of these models. Yet, our findings are consistent with the general notion that adding an asset with a positive return that otherwise has a low correlation to an existing portfolio can help improve risk-adjusted returns. Investors that consider gold a barbaric relic should look for other alternative investments with low correlation to the S&P; but others may want to take a closer look, given the low correlation gold has historically exhibited to the S&P. Using the same models, let’s add gold to a portfolio of stocks and bonds. We’ll start with a static 60/40 ratio of stocks to bonds—often referred to as a “balanced portfolio”—and then add the “optimal” amount of gold to the mix. The term “optimal,” by the way, is the term academics refer to as the one that yields the highest (optimal) risk-adjusted returns; the Sharpe ratio shown in the tables is a measure of return adjusted for the risk (standard deviation) associated with the returns. In this example, gold’s optimal allocation has decreased to 42% from 68%, but it has outperformed the model “60/40” stocks/bonds portfolio. Gold also lowered overall portfolio risk. These outcomes imply a much higher than anticipated optimal allocation to gold in a portfolio. Intrigued by these findings, we wanted to see whether this Gold Effect holds over an even longer period of time. For this test, we dated the analysis back to 1971 and used our models to calculate an optimal allocation between the S&P and gold. The verdict? The optimal gold allocation drops from 68% to 29%, while the allocation to the S&P rises from 32% to 71%. Keep in mind that during this period gold endured a bear market for about 20 years. The optimal amount of gold held in a portfolio fell substantially over this longer period, but 29% is still a much higher allocation than most financial advisers recommend. Our last table shows the mix for an even longer time horizon of 80 years. For the most part, adding a gold allocation to a portfolio has increased return relative to risk in our hypothetical and highly quantifiable examples. Gold has been written off before, and there’s certainly no guarantee the price of gold will appreciate. However, this analysis demonstrates that gold’s role in portfolio management has been under-appreciated. Investors may want to consider actively looking to add uncorrelated assets to their portfolio, and gold should be part of any consideration. Axel Merk is an authority on currencies and a pioneer in the use of strategic currency investing to seek diversification. A graduate of Brown University, Axel is the president and CIO of Merk Investments, and manager of the Merk Funds, a firm he founded to make his investment philosophy accessible to retail investors. Axel is an expert speaker and author on topics ranging from the global economy, gold, and currencies to sustainable wealth and personal finance. He is a regular guest and contributor to the business media around the world including the Wall Street Journal, Barron’s, Financial Times, Bloomberg, and CNBC. Axel Merk and the Merk Research Team publish their views and analysis in Merk Insights and Merk White Papers. Contact: www.merkinvestments.com.